You will find quiz questions at the end of every video course which will help you to assess your learning progress. The related articles and scripts included in the learning material will deepen your understanding of the content. 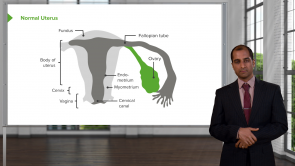 Start now and learn about uterine and fallopian tube diseases at your own pace! A uterine rupture represents an important complication during pregnancy, as well as during delivery. A uterine rupture can become a life-threatening emergency which requires an immediate Caesarean section. The patient complains about severe, devastating pain. The uterus feels rigid when palpated, and signs of hypovolemic shock are visible. This article presents you with a compact overview of this complication. Get prepared for your anatomy exams: Here, you will find the most important information on the structure and function of the woman’s internal and external sexual organs. Abnormal uterine bleeding (AUB) is calamitous for many women. 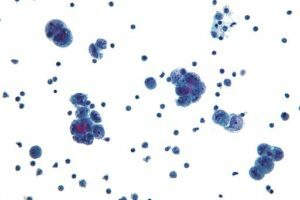 With a brief prologue to AUB, this article focuses on the significantly relevant causes of AUB, such as endometrial polyp, leiomyoma and leiomyosarcoma. Endometrial hyperplasia is abnormal growth of the endometrium in the uterus. It is caused by excess estrogen unopposed by progesterone. Pathology shows an increased gland-to-stroma ratio and can show atypia. Atypia is linked to endometrial cancer, the most common gynecological malignancy in the developed world. Treatment includes progesterone therapy and if there is atypic hysterectomy is recommended. Lynch syndrome has a high lifetime risk of developing endometrial cancer. 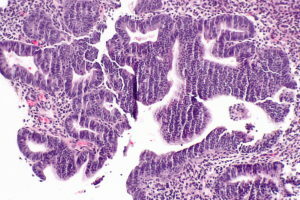 Salpingitis is the inflammation of the fallopian tubes usually due to gonorrheal or chlamydial infections, but other gram-negative and anaerobic bacterial pathogens have been also implicated. Patients can present with lower abdominal pain, fever and an elevated erythrocyte sedimentation rate. Ultrasonography and diagnostic laparoscopy can help confirm the diagnosis of salpingitis and exclude other differential diagnoses or associated complications such as hydrosalpinx, adhesions, and tubo-ovarian abscesses. 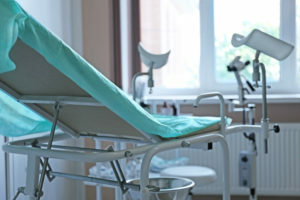 Antimicrobial management is the mainstay of treatment and surgical management should be reserved to patients with non-responsive tubo-ovarian abscesses or ruptured abscesses. Anovulatory cycles are a symptom and not a disease. Polycystic ovary syndrome, pituitary microadenoma, impaired GnRH release, and hypothyroidism are common etiologies for anovulation and should be excluded. Patients can present with amenorrhea which needs etiology-specific treatment or with acute dysfunctional uterine bleeding which might need emergency treatment. Emergency treatment can be either medical with estrogen or surgical with dilation and curettage. Oral contraceptive pills can be used in an attempt to make the menstrual cycle more regular before trying more specific treatments. Fallopian tube tumors are rare with an incidence of 3.6 per one million. 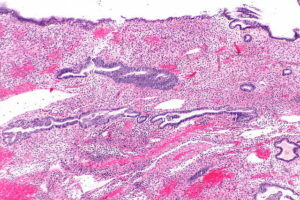 Fallopian tube carcinoma is of epithelial origin and share similar pathogenesis mechanisms with epithelial ovarian cancer. Early obstruction of the fallopian tube results in rapid onset of symptoms such as abdominal pain and distension and patients with fallopian tube carcinoma usually present at an early stage. Treatment of choice for early stage fallopian tube carcinoma is surgical removal of the tumor and any involved pelvic structures. Endometriosis is a common disease in which ectopic normal endometrial tissue is implanted outside the uterus. The ovaries along with other pelvic organs can be involved. 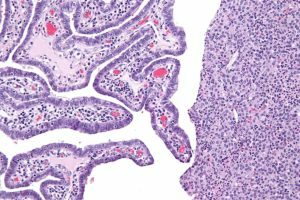 While laboratory investigations have a limited utility in the diagnosis, imaging and laparoscopic evaluation can be used to confirm the diagnosis of endometriosis. Medical treatment of endometriosis involves hormonal manipulation with oral contraceptive pills, danazol, GnRH analogues and progesterone supplementation. Surgical treatment can be either conservative or radical, depending on whether reproduction is wished to be preserved or not.